Britt: Thank you. Welcome, everybody. Throughout this whole week, we have so much amazing information for you guys. We are going to talk about some of the sensory regulation pieces today, and then we are going to go from there. I am now based out of Tennessee, but before that, I was in Denver, Colorado and studied underneath Lucy Jane Miller at the STAR Center. I also worked for a school district there. A lot of the information I am presenting at the beginning is Lucy Jane Miller's research. She has given a great foundation for how we look at children with sensory processing disorders (SPD). At least 1 in 20 people in the general population are affected by Sensory Processing Disorder. Sensory Processing Disorder is a complex disorder of the brain that affects children and adults. We can see kids with poor motor systems, but they may also be over-responsive to certain sounds or textures. One in 20 people, in the general population, are affected by SPD. These kids can also have sensory challenges as well. However, some children can have only sensory processing disorders with no other comorbidities. We have to educate teachers, parents, and others in the field, that just because a child has sensory challenges, that does not automatically mean that they are on the autism spectrum. Often when we start a sensory program or work on regulation, many assume the child must have autism or attention deficit disorder. While that can be true, it is not always the case. Studies have found a significant physiological difference of children with SPD and children with ADHD. SPD has unique symptoms that are not explained by other known disorders. Now, let's talk about the eight sensory systems. There are the five sensory systems that most of us know. The other three are what I call the hidden senses. They are the vestibular system, the interoception system, and the proprioception system. The vestibular system is governing your balance, like where your head is in space and how fast we are moving. We know a lot about the vestibular system as OTs, but it is so important that we explain this to our others, especially the teachers. They do not necessarily know how to incorporate vestibular strategies into the classroom. This is input to the muscles and joints that tells us where our bodies are in space. And then, interoception is the sense of your internal systems and organs. This is a diagram of the SPD subtypes from Dr. Lucy Jane Miller. This breaks down the subtypes of SPD, and we are going to go through each area. The first one we are going to talk about is sensory over-responsiveness. Kids, who are over-responsive, feel like things are too quick, too big, or last too long than typical kids. It is hypothesized that their threshold is actually too low. They feel things more intensely. For this, we want to try to raise their threshold up to a more normal range. An example is that they may hear a sound and cover their ears. They may also cling to you because they are over-responsive to vestibular input. They also do not care for touching anything sticky or gooey. Via sensory integration, we are trying to raise this threshold for them to have a more normalized response to stimuli, instead of that fight or flight response. There are kids who are under-responsive. We hypothesize that their threshold is really high. They do not register input until it is too late. One example is a child not participating in a group activity. The teacher might say, "Sarah's not really singing with us, and we are wondering if she is shy or not processing the information." One mom said, "Well, she sings all the songs in the car on the way home." This might show a delay in the registration of all that information. These kids may also demonstrate a flat affect and lethargy. We need to get their threshold in a more normal range. Then, we have the kids that are sensory cravers. These kids are seeking out input all of the time. They are constantly on the go, moving, putting stuff in their mouth, giving high fives, crashing, etc. With these children, they need richer sensory work. If we give them movement paired with heavy work, then that is more regulating. We want to pair vestibular and proprioceptive activities together to help bring them into that "just right" zone. These are the kids constantly want to spin. You cannot let them spin and spin, because they are not filling their sensory system up, but rather they are going into that over-responsive phase. We need to direct them to more functional activities. For example, obstacle courses are great for them. If you are trying to get them to participate in an activity, they may need to have some sensory regulation before they are able to sit and focus on what is going on. We regulate our nervous systems every day. We can become overwhelmed or stressed out, and in those moments, we may have a shorter temper or patience level. I have a two-year-old at home and getting ready to have the next one. There are definitely days when I need to go take some deep breaths and need to regulate my central nervous system. If we are giving them something challenging, like a really difficult classroom activity or math problem, we need to help them figure out how to become successful at that moment. And if they are having a hard time sitting and focusing in order to complete classroom work, we need to instruct the teachers in how to utilize movement paired with heavy work. 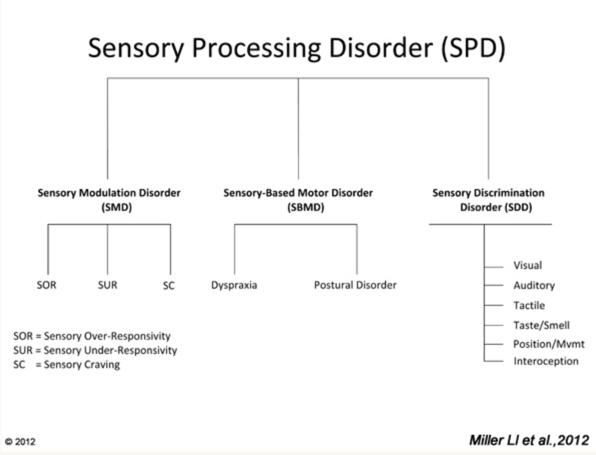 The second subtype of SPD is sensory-based motor disorders. Dypraxia is a difficulty with ideation, sequencing, and motor planning. A postural disorder is when a child has difficulties with their overall tone and trunk strength. These kids appear clumsy, awkward, and accident-prone. They may have trouble with writing or navigating the classroom. They may prefer sedentary activities or try to hide their motor planning challenges with like fantasy play and verbalization. These children need us to help break down activities to help them carry out the motor plan. When we start talking about motor planning and praxis, this ties straight into executive functioning. Let's use writing for an example. Many kids in elementary school have no idea how to manage a writing assignment. Many interventions include using thinking maps and templates to help with their thinking process. What is the idea? How are we going to organize those thoughts? Once they plan the task, how are they going to execute that? Are they handwriting it, or are they typing it? Are they voice typing it? I have teachers come to me all the time saying that kids are writing two or three sentences and do not know how to really delve deeper into that. For younger children, they may trouble even drawing a picture or learn how to write their letters. What programs are teachers using? Are they using Handwriting Without Tears or CR Success Learning? When I have a live audience, I make people get up and move around. Today, we are going to do something we can do in sitting. Try to touch each finger in sequence with your thumb. Now do that with both hands. This is something I do often with kids. Another is the finger to the nose task with their eyes closed. The Bruininks-Oseretsky Test of Motor Proficiency, Second Edition (BOT-2) has motor planning things in there. If you are administering others, like the Beery-Buktenica Developmental Test of Visual-Motor Integration, Sixth Edition (BEERY™ VMI), this will tie in the visual piece. I try to explain motor planning to teachers by giving them examples of what motor planning could look like. For example, jumping jacks are hard as the kids have to coordinate their bodies. We have to break that down for them. This is the same process of forming a letter and holding a pencil. We need to also break down these tasks. Figure 2. Example of a motor planning task. The next subtype we talk about is postural control. Individuals with postural disorders have difficulty stabilizing their body. If they cannot co-contract their core muscles to maintain that upright position, they may fall out of their chair or have trouble sitting and focusing. A lot of the times, dynamic posture is easier than static posture. I know kids that can ride a bike, ski, or run, but they cannot sit still in their chair. Do their feet touch the floor? Can we put phone books underneath their feet? Duct taping phone books is a really great strategy that I am sure many of you already use. Are they in the right chair? Could they benefit from a ball seat or a wiggle seat? I love alternative seating like the wiggle seat and Zuma rocker chairs. We have gotten a grant before to buy alternative seating like that, so. How do you find that just right challenge for the kids to be able to push them but not push them too fast or too hard to avoid shutdown or pushback? For many kids, who are on the autism spectrum, have ADHD or a combination of sensory challenges or developmental delays, you are going to have to adjust your thinking depending on what the expectation is. If you are talking about a young child on the autism spectrum, and they are in a more moderate needs kind of classroom, then you are going to be giving them a lower-end challenge and finding out where you can push them. If you are talking about a child who is in the regular education classroom, but you are pushing in or pulling out for services, what does that look like? And, how can you help educate the teachers because they are the ones that are there all day? There is so much variety with school-based OT, and so much of it depends on your school district and where you are. If you see kids 15 minutes every other week, it might be really hard to feel like you are making a difference. This is why education of staff is so important. One program that I love to use is the Zones of Regulation. This was designed by Leah Kuypers, and it is part of the Social Thinking program by Michelle Garcia Winner. These programs are terrific! Our psychologist, speech therapist, and I all took this course a couple of years ago. We have also started to adopt this into every classroom, and now, the teachers and the students all recognize the different colors. The green zone is the "just right" zone. That is where the kids are functioning and learning. They are happy, focused, and calm. We also use that "ready to learn" terminology from them. Kids in the blue zone might be sad, sick, or tired. It is ok to have these feelings, but this is not going to be the best zone for them to be learning. The yellow zone is when those kids are excited, silly, wiggly, or when they are really frustrated and worried. I tell the kids that it is okay to be in yellow when on the playground, in P.E., or after school playing with their friends. It is also okay to feel frustrated or to feel worried, but it is not okay to then get into the red zone, where you are mad, hitting, yelling, or are acting out. We talk a lot about how to get back to the green zone. We can use mindfulness, deep breathing strategies, or heavy work strategies. They may need to take a break. Every kid is so different, but we teach the students how to utilize the zones to see where they are. The teachers also need to read cues to help the kids get back into the green zone. "Okay, guys, we are all starting to get a little bit wiggly and having a hard time focusing. How about we stand up and do a movement break?" GoNoodle is an amazing web-based movement program for kids and teachers. For example, they can get up and do a little fun dance to music. There are many other programs out there that get kids up and going. In my last school, I created like a sensory movement break for kids. It started with standardized testing where they would all get a three-minute movement break. During this break, I wanted them to do something functional because if you do not give them something directive, the kids will just stand around. 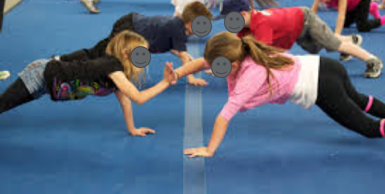 So, I created a visual for the classrooms where kids would do jumping jacks, push fives with partners, a finger to nose task, and then reaching up and stretching. They would then sit back down and take some deep breaths before starting their activity again. We need to teach these kids that while it is okay to be sad or tired, we need to wake our bodies up. We do that with movement. It is also okay to feel frustrated and angry, but you cannot overreact to things like breaking their pencil and then throwing something. They need to learn strategies like deep breathing, taking a walk, and walking away. Part I: This course will outline the evaluation and treatment principles for the pediatric orthopedic hand patient, including the traumatic hand injured patient, and how it differs from the adult hand population. This course will provide specific evaluation techniques along with treatment ideas. Part II: This presentation will build on the foundational information provided in Part I. It provides the learner with specific information on the evaluation and treatment of the congenital hand patient and the unique challenges this brings to clinicians. Explore functional issues unique to this population and interventions that may assist in improving their abilities. It is essential that OT/OTAs and PT/PTAs are seeking the knowledge of current laws and considering patient protection with electronic documentation. In a world where technological advances are rapidly occurring, it is essential that OT/OTAs and PT/PTAs stay abreast of the latest research regarding implementing technology into clinical practice.